Introduction: Hearing loss in early life hampers development of children, early detection of hearing loss in paediatric age group gives opportunity to treat it and good speech and overall development of children. In this study BERA was done on high risk children and various risk factor compared. Comparison between BERA and OAE was done as a screening test. Aims: To evaluate the hearing threshold and find the incidence of deafness in high risk paediatric age group category and analyse the common risk factors and to compare BERA with OAE.Materials and Method: 60 infants and high risk children were subjected to BERA after detailed ENT examination. In 0 to 5 year age group dPOAE was done on same sitting. Results analysed. Statistical Analysis Used: Relative risk ratio was done for each risk factor. Sensitivity and specificity of OAE in comparison to BERA as a gold standard was done. Results: In this study 42% of high risk children showed hearing loss. Most common risk factor among children with hearing loss was consanguineous marriage (24%) followed by neonatal jaundice (16%), low birth weight (12%) and others. Comparison of OAE and BERA with BERA as gold standard test shows sensitivity of OAE is 96.15%, specificity is 72.73%. Conclusion: All high risk children should be screened with BERA early so that children with hearing loss identified and taken care for that. In centre where no experts available OAE can be used for screening of high risk children as OAE has a good sensitivity. Hearing is an important sense humans have; it is very important for speech and language development, communication, and learning. Hearing loss in children constitutes a considerable disability because it is an invisible disability that can compromise their optimal development and personal achievement. The prevalence of congenital hearing loss has been estimated to be 1.2–5.7 per 1000 live births. Early detection and appropriate treatment provides the best choice, maximizing the critical period of hearing and thereby availing the resources to improve hearing and oral communication skills. However, diagnosis of these children at an early stage can be a diffi cult task even for the experienced clinician. Choosing the appropriate method and instrument in establishing the clinical diagnosis at an early stage is also practically diffi cult. Brainstem-evoked response audiometry (BERA) is a simple, noninvasive, objective test for early identification of hearing impairment in children and neonates. It can be used as a screening test and is useful in newborns, infants, and other difficult-to-test patients. In this study, threshold estimation was done using BERA in high-risk infants and children to detect hearing loss and also find the degree of impairment. This prospective study was carried out on sixty patients of 0–18 years of age at the outpatient ENT department of our institute from November 2015 to October 2016. Neonates with high-risk factors, children with delayed speech and language development, and those who did not respond to sound were included in the study. 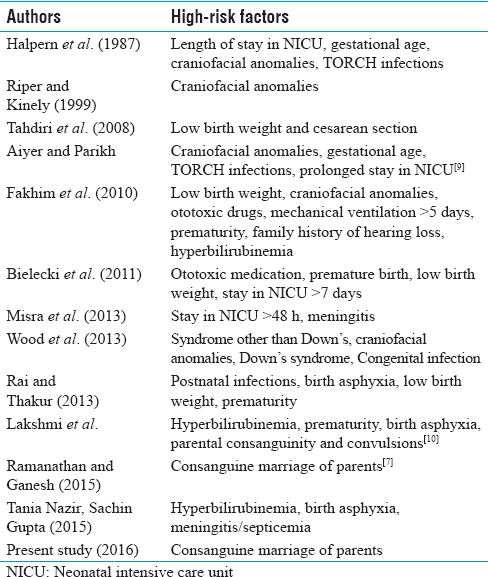 Risk factors included were consanguineous marriage of parents; family history of deafness; birth asphyxia; low/increased birth weight; delayed cry; prematurity; mental retardation; neonatal jaundice; maternal infection; uncooperative patients for Pure Tone Audiometry (PTA); patients with a history of trauma; patients with a history of hospitalization for infectious disease such as meningitis and encephalitis; patients given ototoxic drugs; and patients on Anty Tuberculosis Treatment (AKT); suspicious of malingering. Patients aged >18 years and patients aged <18 years and cooperative for PTA were excluded from the study. Detailed history taking and general and ENT examination were done to rule out external-ear and middle-ear pathology. BERA was done in a dust-free, sound-proof, air-conditioned room. Feed was given 10–15 min before the procedure. Syrup triclofos 20 mg/kg was given to sedate the children ½ h before the procedure. Stimulus – 11/s or 21/s. Threshold stimulation was done by starting at 100 dB sound pressure level (SPL) and then gradually coming down to lower side till wave V was just identifiable with satisfactory morphology. The child's hearing sensitivity will be assessed based on the following. Profound hearing impairment: 90 dB and above. In children under the age group of 0–5 years, otoacoustic emission (OAE) was done at the same seating with the use of Intelligent Hearing Systems OAE instrument. In this study, distortion-product OAE (DPOAEs) were used. Of the sixty infants and children screened, 25 patients (42%) showed decreased hearing [Chart 1]. Among them, 14 were male and 11 were female patients with a male-to-female ratio of 1.3:1. And, in normal hearing group, male-to-female ratio was 1:1 [Chart 2]. Among the patients screened, 80% of patients fall under 0–5 years' age group. And, 20% belonged to 6 to 18 years of age. Nearly 88% of patients with decreased hearing on BERA fall under 0–5 years' age group [Table 1]. Almost 40% of patients with decreased hearing showed profound hearing loss, 40% showed severe hearing loss, and 20% showed mild-to-moderate hearing loss. 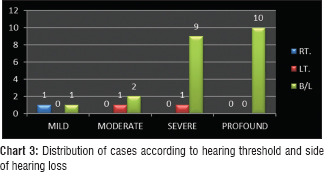 Most of the patients (92%) showed bilateral ear involvement [Chart 3]. Patients having severe-to-profound hearing loss aged from 0 to 5 years. Patients with mild-to-moderate hearing loss aged from 6 to 18 years [Table 2]. Out of the screened patients with high-risk factors, the most common risk factor presented was neonatal jaundice (18.33%) followed by low birth weight (15%), consanguine marriage in parents (13%), and other risk factors such as birth asphyxia (10%) and others. And, 16.67% had no risk factors. Among the patients detected with decreased hearing, the most common risk factor was consanguineous marriage (24%), followed by neonatal jaundice (16%), low birth weight (12%), and others. The most common risk factor in patients under <1-year age group with decreased hearing was low birth weight (33.33%). The most common risk factor in patients under 1–5 years' age group with decreased hearing was consanguineous marriage of parents (46.15%). 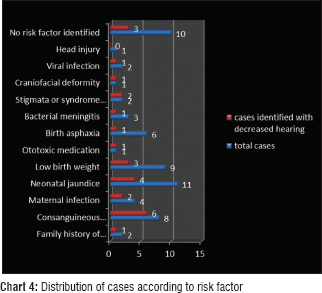 Patients under 6–18 years of age showing hearing loss were not identified with any risk factors [Chart 4]. Among the most common risk factors, consanguineous marriage of parents shows a relative risk of 2.5 with statistical significance level (P < 0.05) [Table 3] method for relative risk. In the study of various parameters of BERA between patients with risk factors and without risk factors, threshold shows statistically significant difference and other parameters such as interpeak latency (IPL) difference of wave V and wave 1, and average absolute latency of wave I did not show statistically significant difference. Values were statistically tested with t-test (P < 0.05 was considered significant) [Table 4]. In this study, comparison of OAE and BERA/auditory brainstem response (ABR) with ABR as gold standard test shows sensitivity of OAE as 96.15%, specificity as 72.73%, positive predictive value as 80.65%, and negative predictive value as 94.12% [Table 5]. The incidence of hearing impairment in high-risk infants according to different statistics varies from 1% to 40%. 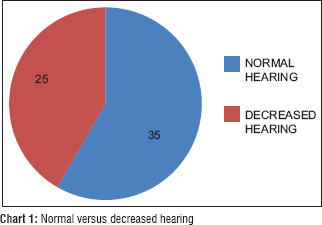 In this study, 42% of the total patients showed decreased hearing, which is comparable to the study by Ramnathan and Ganesh who found hearing loss in 44% of patients among 125 patients screened. In the present study, incidence is on higher side as compared to the prevalence of hearing loss in population as in the present study we have included children with high-risk factor. 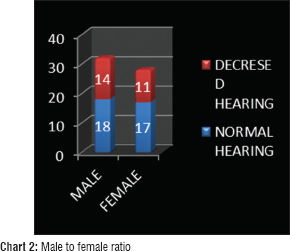 We have found male-to-female ratio to be 1.3:1 among patients having hearing loss, so there is no gross difference in male-to-female ratio. In this study, 80% of patients belong to 0–5 years of age group. And, most of the patients (88%) who had decreased hearing fall under the age group of 0–5 years. In the study of Thirunavukarasu et al., 68% of patients belonged to 1–5 years of age group, while in our study, it is 52%. As language development starts generally during 1–3 years of age, parents detect decreased hearing or delayed speech during this age most commonly. Hence, patients come to ENT specialist or audiologist during this period of age most commonly. On taking history or checking the previous record of patients, mostly patients have risk factor for developing hearing loss. Almost 80% of patients in the present study showed severe-to-profound hearing loss, which was 68% in a study by Bhagya et al. Nearly 92% of patients showed bilateral ear presentation. Patients who had severe-to-profound hearing loss fall under the age group of 0–5 years and patients who had mild-to-moderate hearing loss fall under the age group of 6–18 years. Hence, in patients with mild-to-moderate hearing loss, complaint gone unnoticed by patients and patients had presented late to ENT surgeon. And in 0–1 year of age, we have included patients with risk factors who show severe-to-profound hearing loss and bilateral presentation. In the present study, the incidence of hearing impairment using BERA/ABR in the children who had at least one risk factor was 44%. These results were lower as compared with the results of Aiyer et al. and Lakshmi et al., who found the incidence of hearing impairment in infants who had at least one risk factor to be 76.67% and 64.9%, respectively. In the present study, consanguine marriage of parents shows a relative risk of 2.5 with statistical significance level (P < 0.05). Other risk factors such as stigmata or syndrome were known to induce hearing loss with risk factor 3.3333 and craniofacial deformity with relative risk 3.3333. Other risk factors such as low birth weight, birth asphyxia, and neonatal jaundice showed low relative risk with no statistical significance. The risk factors identified in various studies are summarized in [Table 6]. In the present study, there is difference between threshold of patients exposed to high-risk factors and those who were not exposed to high-risk factors with statistical significance (P = 0.027 for right ear and P = 0.0099 for left ear). In this study, patients who are exposed to risk factors and having hearing loss showed severe-to-profound hearing loss and patients not exposed to risk factors and having hearing loss showed mild-to-moderate hearing loss which might be the reason for difference of threshold between the two groups. The present study demonstrated a significant increase of Wave I–V IPL. The IPL is a reflection of neural conduction time between the auditory nerve and the brainstem nuclei and reflects upon the efficiency of the auditory pathway. Prolonged I–V IPL is a feature of neurological impairment and is indicative of delay in neurological conduction within the brainstem. Evidence that both the peripheral and central components may be abnormal during the early stages and the impairment may be temporary in some infants is provided by Kileny et al. The present study results are almost consistent with that of Aiyer et al. who found in their study that ABR parameters such as interwave I–V intervals were signifi cantly prolonged in high-risk infants. Lakshmi et al. found in their study that absolute latencies of Wave III, V and Inter – peak latencies of I–III and I–V were prolonged in their cases. In this study, comparison of OAE and BREA/ABR with ABR as gold standard test showed sensitivity of OAE as 96.15%, specificity as 72.73%, positive predictive value as 80.65%, and negative predictive value as 94.12%. Richardson et al. found in their study that OAE screening test had a sensitivity of 100%, a specifi city of 91%, a positive predictive value of 44%, and a negative predictive value of 100%. Xu et al. found that the sensitivity was 97% for DPOAE, while Dhawan and Mathur found a sensitivity of 80% and a specificity of 92.8%, which were higher than the present study. The study reveals consanguineous marriages and family history of deafness as the risk factors responsible for significant incidence of hearing loss. Hence, people must be made aware about this situation and should be encouraged to prevent the risk factor. American Speech-Language-Hearing Association. (n d.) The prevalence and Incidence of Hearing Loss in Children. Available from: http://www.asha.org/public/hearing/disorders/children.htm. [Last retrived on 2017 Oct 17]. Sujata DE, SliE ARCHBOLD AI\JD RAY CLARKE. investigation and management of the deaf child. ScottBrown's Otolaryngology, Head and Neck Surgery. 7th ed. 2008. p. 844- 57. Brad Stach, audiological evaluation of otologic/neurootologic disease. Glasscock-Shambaugh: Surgery of the Ear: 6th ed. 2010. p. 189-222. Biswas A. Assessing the Deaf Child. Clinical Audio Vestibulometry for Otologists and Neurologists. 3rd ed. Mumbai: Bhalani Publishing House; 2002. p. 96-100. Available from: http://www.indianpediatrics.net/may1999/ may-461-463.htm. [Last retrived on 2107 Oct 17]. Ansari MS. Screening programme for hearing impairment in newborns: A challenge during rehabilitation for all. Asia Pac Disabil Rehabil J 2004;15:83-9. Thirunavukarasu R, Balasubramaniam GK, Kalyanasundaram RB, Narendran G, Sridhar S. A study of brainstem evoked response audiometry in highrisk infants and children under 10 years of age. Indian J Otol 2015;2:134-7. Bhagya VA, BridS VB, Doddamanic M. incidence of hearing loss in infants at risk. Int J Biol Med Res 2011;2:1102-5. Aiyer RG, Parikh B. Evaluation of auditory brainstem responses forhearing screening of high risk infants. Indian J Otolaryngol Head Neck Surg 2009;61:47-53. Lakshmi T, Sultana Z, Brid SV. Comparative study of brainstem evoked response audiometry in high risk infants. Int J Recent Trends Sci Technol 2014;12:8-12. Kileny PR, Magathan MG. Predictive value of ABR in infants and children with moderate to profound hearing impairment. Ear Hear 1987;8:21721. Richardson MP, Williamson TJ, Reid A, Tarlow MJ, Rudd PT. Otoacoustic emissions as a screening test for hearing impairmentin children recovering from acute bacterial meningitis. Pediatrics 1998;102:1364-8. Xu ZM, Li J, Hu TZ, Sun JH, Shen XM. Sensitivity of distortion product otoacoustic emissions and auditory brain-stem response in neonatal hearing screening, a comparative study. Zhonghua Yi Xue Za Zhi 2003;83:278-80. Dhawan R, Mathur NN. Comparative evaluation of transient evoked oto-acoustic emissions and brainstem evoked response audiometry as screening modality for hearing impairment in neonates. Indian J Otolaryngol Head Neck Surg 2007;59:15-8.